The hardest paycheck you’ll ever make in your freelance business is the first. Going from $0 to $100 is a lot harder than going from $1,000 to $10,000 because you’re making something out of nothing. It involves a new mindset. When you’re employed by somebody else, your only job is to do well at the assignments you’re given. When you’re self-employed, you suddenly have two jobs: to do good work, and to find work to do in the first place. If you’re at $0 in your freelance career, I’ve listed a few places you can start your search. 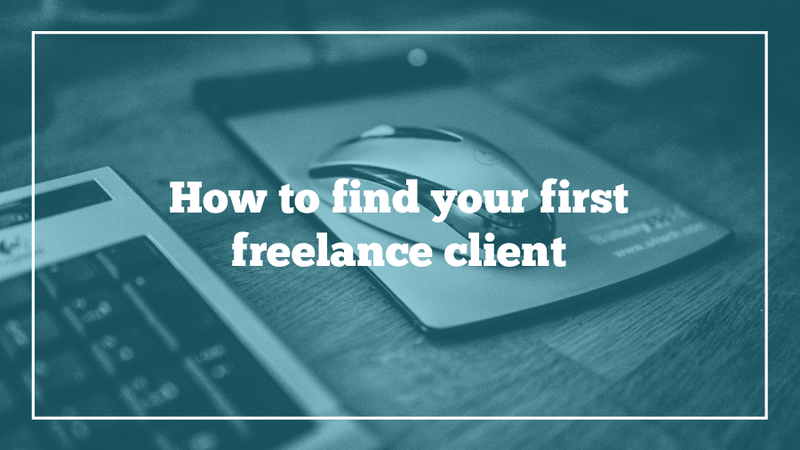 You might already know your first client. The best way to find out is to write an introductory email to your social circle outlining your product or services. Frame it as an announcement: “Friends, I wanted you to be the first to know about my new web design business,” include your new website with a list of ways to work with you, and show people where they can contact you if they or anyone they know might be interested. This might seem like surprising advice from me considering how outspoken I am against multi-level marketing stuff like Mary Kay. The reason is that they force you to make constant sales pitches to your friends and family in an unnatural (and unfriendly) way. By treating your friends as nothing but marks, eventually you’re going to be left with no friends. Your friends don’t want to be your regular income stream, but they do want to see your business succeed. That’s why I think one initial email to people who care about you is perfectly fine, and in fact something you’d be remiss not to do. I always ask prospective clients how they heard about me, and some of them are friends of friends, or know one of my college professors, or a previous client suggested they work with me. There’s a world of difference between pitching your social circle just once and endlessly exploiting it, and you’re smart enough to recognize it. In 2017, I got several clients simply by checking my inbox on LinkedIn. One of my biggest mistakes early on was ignoring LinkedIn because I thought that just because I didn’t have a traditional job, LinkedIn was no longer going to be useful for me. I completely underestimated how many employers use LinkedIn searches to find freelance contractors like me. Right now, I get the majority of my writing jobs through a Facebook group for freelance writers. My favorite group is women-only, but it can get even more exclusive than that—I’m in groups for just video game writers, or just finance blogs. Editors post what they’re looking for and invite writers to pitch to them. In my experience, this can lead to regular, recurring work. I joined Solopreneur Circle DC in order to meet “coworkers” and get out of the house. Twice a month, we gather for knowledge sharing and/or brunch. I’ve met business owners who do all kinds of work, from graphic design to real estate to styling hair to styling Instagram photos. Some of them make a lot more money than me, which is highly educational in its own way. All of us have stories about dealing with clients, dealing with taxes, or which bookkeeping software to use, so being in a community has helped me refine my business a lot. It’s also grown my business through new income. Since we all have different lines of work, it means that we frequently pass clients to one another. I had a web design client who needed a print pamphlet designed, so I forwarded her to one of the entrepreneurs I know. A logo designer was asked if she did website maintenance, and since she didn’t, she recommended that client to me. I still do regular web upkeep for that client today. Local communities are great because what we have in common is our location instead of our profession. That means I have a local network of business owners who know to recommend me, and I always have a specialist to recommend to clients who want a service I don’t do. Later, when your freelance business has taken off, you’re going to reflect fondly on those days you had so much free time. I think this is the perfect time to work on something that requires a lot of initial unpaid work, but then generates income for years to come. 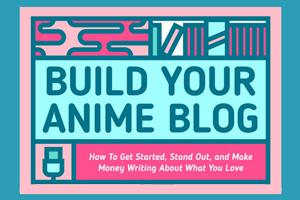 I’m talking products like my Niche Journalism Workbook, or books like Build Your Anime Blog. The workbook took me a week to build; the book took me two months—and it’s not like that was the only thing I worked on during that time. I didn’t get paid while I wrote either of them, but I still sell copies of both years later. And since both of them include a call to action in the back about other products I sell and other ways to work with me, they sometimes lead to repeat customers who, after reading, decide to work with me as a web designer or copywriter. Sometimes your passive income product can also serve as a portfolio. If you’re a writer, your ebook can prove your impeccable grammar. 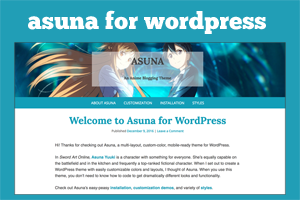 If you’re a web designer, a downloadable theme (like my free Asuna) can prove you can actually code. It may feel like you’re doing it for nothing at the time since you’re not getting paid, but it’ll be something you can sell forever. 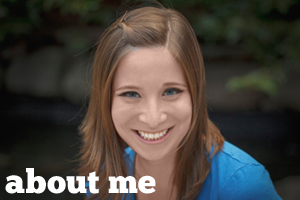 I started freelancing full time in January 2013. It took until April 2013 for me to be able to pay my bills with it (instead of just drawing from my savings). I know you can turn that $0 into a sustainable source of income. You just need to know where to look. Productivity isn’t about what you do. It’s about what you don’t do. I don’t know who first came up with this quote, but after this week I know it is true. As you might have noticed from my distinct lack of tweeting, I quit Twitter. Again. And in the meantime, I filled my empty days with a lot more work and a lot less worrying. The problem is, I trick myself into thinking my time on Twitter is productive. Especially now that I have more than 7,000 followers and get a lot of likes. I live for those likes and it isn’t healthy. It feeds into my anxiety and I get that giddy, empty feeling every time I scroll. Last time I quit Twitter, I vowed to limit my time on it. That did not happen. In 2017, I spent 485 hours on social media, and I spent more time on Twitter than any other social website! Last year I also made less money than I wanted to, and never seemed to have enough time in the day. I knew where this was going, so it was time to, once again, go cold turkey. I woke up early and immediately checked Twitter. Everybody was talking about Otaku Coin: Chris MacDonald, my employer at Anime News Network, was serving on the same advisory board as Palmer Luckey. I don’t know what Luckey’s views are, but he funded a pro-Trump group that posted white supremacist and anti-Semitic material on social media. I thought I was going to need to cut ties with Anime News Network right away. I was so deeply invested in what turned out to be speculation that it ruined my mood for a whole day. That’s when I realized it was time for me to take a break and get back in touch with reality. The first thing I did was limit Twitter to 5 minutes a day on my StayFocusd app. When you use the app to limit time on a site, it counts down and eventually blocks it from you completely for the rest of the day. I kept 5 minutes so I could still promote new blog posts on Twitter. But I told myself I would use my profile page while I did that—so I couldn’t see other peoples’ tweets. I only stuck with that until Wednesday. I kept accidentally navigating to Tweetdeck. It’s sort of second nature. I realized I’m not even thinking about any particular purpose when I go to check Twitter. When I was feeling anxious or fidgety, my fingers would just navigate there. 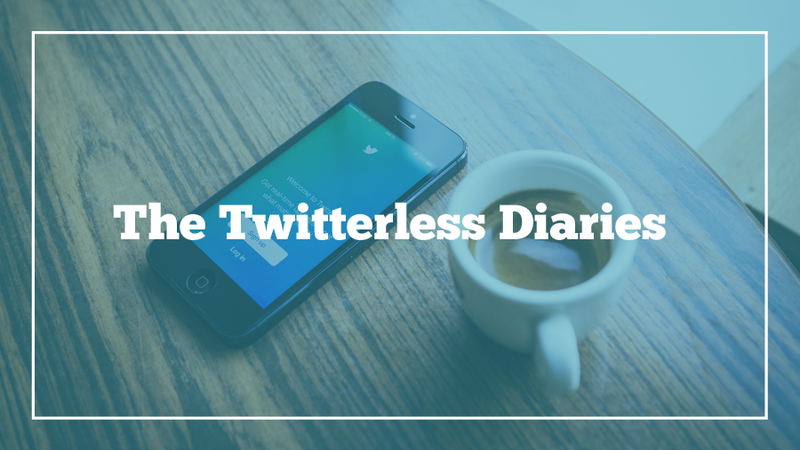 Every time I sat down to do anything at all on my computer, from checking the weather to writing a blog post, I would impulsively try to go to the Twitter page first. That’s when I realized I had a bigger addiction problem than I thought. 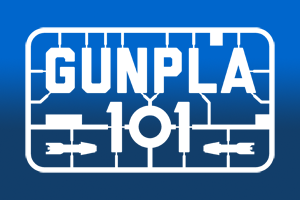 Monday is my blog posting day, so I went to Twitter to promote my new Gunpla 101 and Otaku Journalist posts. I posted and closed the window as quickly as possible to avoid temptation. I managed to resist, but my thoughts for the day took the form of tweets. That morning I found out that the trick to making really fluffy pancakes was to sour the milk with vinegar first, and I wanted to tweet that. I learned I had a stash of Bitcoin from 2013 that I’d forgotten about (it was only 0.50 cents at the time) and I wanted to share my discovery. Even though I spent the day doing stuff with John and a friend, without my Twitter followers I was weirdly kind of lonely. I woke up feeling terrible—headache, fatigue, muscle aches. Withdrawal symptoms. Not from Twitter obviously, but from caffeine. I forgot to mention that, in a supremely terrible bout of decision making, I decided to quit coffee and Twitter in the same week. Anything to get rid of that jittery heart-attack sensation I’d been feeling so often of late. I wasn’t too productive but I managed to get dressed and show up on time for my Japanese study group. Usually, I run a bit late even when I feel fantastic. I think it had to do with the loneliness factor—I am a person who works from home and rarely sees people aside from John. Twitter is a great replacement for a social life, and you don’t even need to leave your house! Without it, I need to try harder. To connect with other people, I have to go out to my study group. I have to text my friends or my sisters, painfully aware that my witty thoughts are only going to be heard by one person. This seems so basic, but it was infuriating. Before, I could be heard by 1,000 different people at once. I got an email from Twitter telling me that it existed and I should go on Twitter. “See all sides of the story. Join the conversation,” it said. This may be a coincidence, but I have all email alerts turned off and I haven’t gotten an email from Twitter in years. That email should have made it easier to avoid Twitter because I am contrary, but I couldn’t resist going back on Twitter after promoting my Forbes post. Minutes after I published a list of the Anime Awards nominees, the PR person emailed me and told me Crunchyroll had altered the list again, and some of the categories she’d given me previously were no longer accurate. It sucked because this story was under embargo for days, and only after the story went live were there new changes. I made the required changes, but I was terrified that people who’d see my article before it was updated were confused and maybe replying to my tweet promoting it. I checked my Twitter mentions, telling myself it was for work, and people were indeed confused. I even responded to somebody who was confused about it and let them know what was up. I did notice that while I did damage control, the now-unfamiliar heart-attack sensation came back. Nothing I could do about it in this case—it really was for work. But better not to feel that way about non-work interactions. Later, John asked me if I’d seen something on Twitter earlier, and I reminded him why I definitely had not, so he told me about Nintendo making toys out of cardboard. I thought he was joking. This was my most productive day of the week, if not my life! I usually get three major tasks done in a day. On Thursday I got six done big things before Japanese class. I even finished a project I’d been putting off since mid-December. I had free time today because I got so much done on Thursday. I got a haircut at the mall and chatted with my hairdresser who is pretty cool—we follow each other on Instagram. (Somehow I’ve never felt addicted to Instagram though, maybe because I post rarely and have so few followers.) When I was finished, I ran some errands like getting my wedding ring inspected for loose gems (I’m supposed to do that every six months but it had been four years) and consulting a makeup artist at Sephora about updating my skincare routine now that I’m over 30. Usually, I hate this kind of stuff but the idea of having opportunities to talk to people, even strangers, was especially appealing to me this week. And that’s the reason I simply have never been able to stick with quitting Twitter. With Twitter, I can tell myself I have 7,000 adoring fans hanging on my every inane thought (though I know half of them are bots and most of the humans don’t actually care). Without Twitter, I am just a lonely, aging woman who spends a lot of time at her computer. I started learning what I had missed when I wasn’t on Twitter. I saw Buzzfeed’s The 29 Stages Of A Twitterstorm In 2018, in which people got mad about an awful T-shirt, culminating in armed police and protesters at the home of an innocent birdwatcher (he has a Twitter name that’s similar to that of the company that made the bad shirt). I immediately noticed how the people who first raised awareness were cheated out of their likes, Twitter’s currency—even though they’re not worth a dime. But I remember getting furious when other Twitter accounts would steal my jokes. What did “likes” ever get me? And secondly, how much of the story was turned into sausage for the Online News factory. That used to be the bulk of my work at the Daily Dot—taking Twitter-manufactured outrage and turning it into a researched article. How mad people always were when I asked for interviews. They were already mad about the thing I was asking them about to begin with. Twitter is a really good place to feel mad about stuff, and remembering that kept me away for another day. I logged onto Tweetdeck. I expected to have missed everything important for a week. But it was amazing how few mentions I had—because I wasn’t tweeting, nobody was responding to me. Twitter went on as usual without my participation, and why wouldn’t it? This site is huge and constantly active—it would take me months to notice a friend I used to tweet at has left. What did I learn from all this? That Twitter is perfectly engineered to feed into my need for approval and praise. It’s an easy replacement for a social life. Heck, it’s an easy replacement for work—when I’m part of the Twitter discourse I feel like I’m enacting real change. No wonder one study discovered that Twitter is harder to resist than alcohol or cigarettes! And as you might know, I tried to quit Twitter in 2015. And failed. I can’t trust my attention-seeking lizard brain, so this doesn’t end here. I still have Twitter set to a 10-minute daily limit with StayFocusd. I’m still going to limit my tweets to promoting posts from Otaku Journalist, Gunpla 101, and Forbes. That’s going to be especially hard: it isn’t going on Twitter itself that is my addiction, it’s the tweet-and-response feedback loop. Twitter is a great way to communicate for a lot of people, and I’m not suggesting that you quit Twitter. I know I’m an extreme case. I think you can tell from this post that I’ve been using an inane social media service as a bad coping mechanism and that needs to stop. My hope is that limiting my Twitter use will actually help you to hear from me more often—through regular blogging, reporting, and my newsletter. Even without the instant gratification of Twitter, I still want to share. I’ll just have to work a little harder to do it. 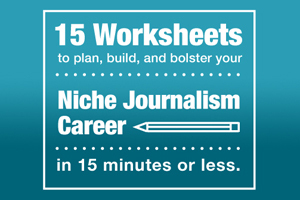 If you recall last January, I wrote a four-post series on how to choose a topic, write content, and launch a niche blog. 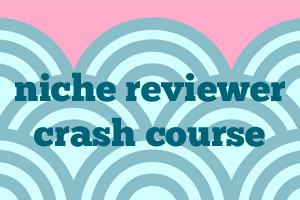 This year, I’m resolving to launch six new niche affiliate properties using the step-by-step I wrote myself. It’s simple enough, but last year I didn’t launch even one. The problem? New business ventures are always a risk. They consist of a lot of work for no immediate reward—and if the idea is a flop, there might never be a reward! It was hard to chase hypotheticals when I had plenty of guaranteed work to focus on. And once I was done with my regular work, I didn’t have the energy or enthusiasm for an additional project. This month I sat down for a couple of sessions with Google Keyword Planner to launch my latest affiliate site—a new blog that covers a mental health topic. I’d been sitting on this dot com for 10 months with no energy to do anything with it. So what changed? I decided to just get it all out in one or two sittings: a larger than usual amount of work in a short amount of time. For a while, I’d had “work on the affiliate site” as a permanent item on my daily to-do list, but I never prioritized it. And the longer I let it sit, the easier it was to continue to ignore. The thing I find tough about New Year’s Resolutions that require a daily commitment is that I have to dedicate a bit of my mental energy to thinking about them every single day. I find it’s hard to build momentum over such a long stretch of time (and studies show it’s not just my impression; it takes 1-3 months of intentional behavior change to form a new habit). So how do you take that short-term emotional momentum and harness it into helping you achieve long-term goals? I suggest batching your work. The same way that it makes more sense to bake an entire batch of cookies on one tray, it’s easier to do a bunch of related tasks on one project all at once, even if it takes more time and effort in the moment. Dedicating five minutes a day after work to focus on a passion project doesn’t work for me because chipping away at a big task so briefly doesn’t build momentum. Instead, I’m more likely to block off an entire day to get a project out of the way. I really have launched projects like this—Gunpla 101 was the result of one long weekend with zero commitments. That was my main concern—I spend so much time on my existing affiliate properties, I was worried about just hiring myself for work I didn’t want to spend my time on. 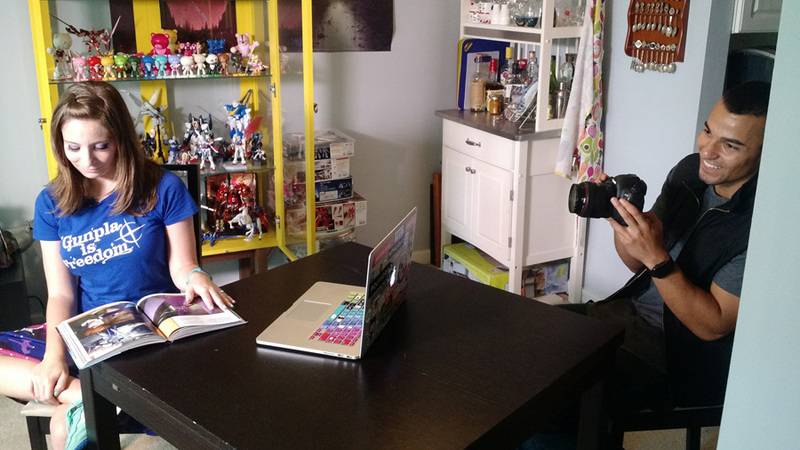 But I rationalized this by realizing that if one of my new properties is a success, I can hire people to write for me like I do with Gunpla 101. For now, I can create a minimum viable product, the bare amount I need to launch, throw it out there and forget about it for a couple of months. Thinking about my passion project as a one-time commitment and not an endless menial job convinced me to finish it. As a freelancer who gets paid by the task and not the hour, I have more time to work on passion projects than the average person (and therefore far fewer excuses not to work on them). That means my perspective on the topic may be very different from yours. 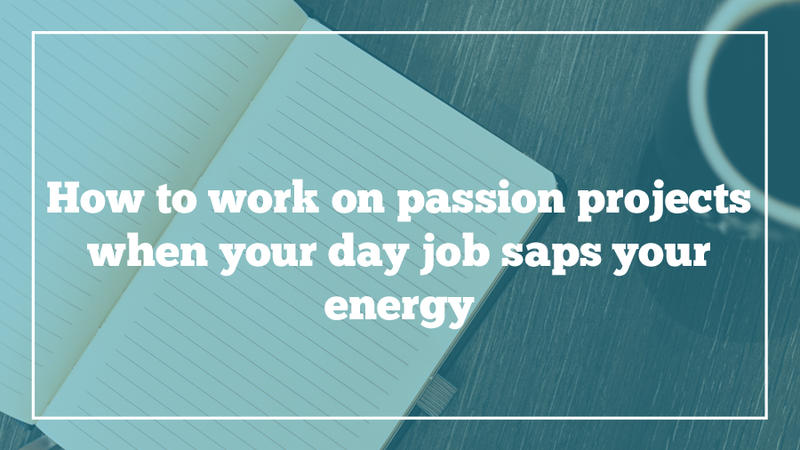 If that’s the case, what helps you stay focused and motivated to work on passion projects? Let me know in the comments. Last month I taped a segment with Fox News. I haven’t watched any of it and I don’t plan to. When I tell people that, even my loved ones who understand me best, they seem puzzled because I’m not shy. I speak loudly with plenty of inflection, and I love trying to entertain other people and make them laugh. I make conversation with everyone from my Lyft driver to my dental hygienist. I’m an introvert, but my friends say I’m the most extroverted introvert there is. But here’s the thing: I really don’t like how I sound. I’ve never gotten over my voice deepening so much when I was a teen. In a few short years I went from being a featured singer in the school choir to being mistaken for my dad when I picked up the phone. That’d be unsettling for anyone, but when you’re a petite five-foot-one woman, it definitely feels weird. Disliking the sound of your own voice is not unique. It’s because we hear sounds differently when they come from inside ourselves. According to the Washington Post, hearing your voice or seeing your face from a second person perspective elicits a reaction similar to disgust. Time Magazine goes a step further and suggests hearing your recorded, unfamiliar-sounding voice is akin to body dysmorphia. Maybe one of my trans or nonbinary readers could weigh in? Even so, I do not avoid opportunities to speak, and that’s why I think it’s hard to convince others that I don’t like my voice. I am on a lot of podcasts. I have been interviewed on the radio and for documentaries. 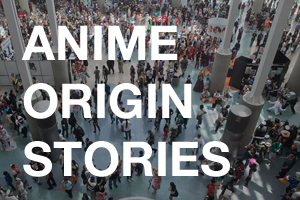 I even sometimes enjoy public speaking, especially when it’s somewhere I feel comfortable, like when I gave a talk on my concept of Otaku Journalism at Crunchyroll Expo (which should be on YouTube pretty soon, but even when it is I won’t watch that either). In short, I don’t have a great voice. I am not a naturally gifted public speaker, or somebody who started out liking it. But through time and practice, I’ve become somebody who can do it on command and even have fun. 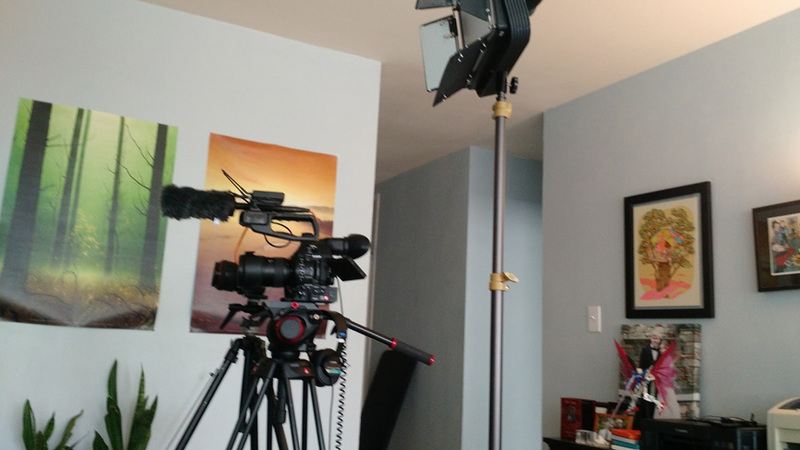 Recording equipment set up in my living room. I think we use “introvert” and “extrovert” as convenient excuses to avoid stuff, when they’re only labels meant to define your natural inclinations. There’s no reason an introvert can’t become a performer and there’s nothing preventing an extrovert from choosing and enjoying a more solitary profession, and letting their social side come out on weekends. I especially hate the smug memes about why introverts (it’s usually introverts) are secretly better. The way I see it, we all have different strengths and weaknesses, likes and dislikes—and far more than you could fit into the two rigid categories of introvert and extrovert (or the eight personality types of Meyers Briggs, for example). These are good starting points, but they are not the end-all be-all of our personal definitions. Yes, we are naturally better at some things and worse at others. But if we avoid the things we want to, we’ll never grow, we’ll never get better, and we’ll feel bad about the stuff we never did and wonder what might have been. Life in your comfort space is nice, and an excellent place to revisit when you’re overwhelmed, but if you spend all your time there, it gets boring. I want to encourage you to be scared of things and still do them. Heck, to be bad at things and still try them! I’m trying to be a good example of this. Which is one of the reasons why I am in Japanese class, even with my bad accent and the fact that I have to study twice as much outside of class to keep up with everyone else. Which is why I run races even though I was always the slowest kid in gym class. Which is why I go on TV even when I’m scared to watch it and see how badly I definitely screwed it up. It may sound like torture to fill your life with uncomfortable, difficult things, but you can start with one thing at a time. I don’t want to live a life where I limit myself to only doing the things I’m good at, and I don’t think you want to, either. To quote Jake the Dog in Adventure Time, sucking at something is the first step to becoming sort of good at something. What will you try today? P.S. 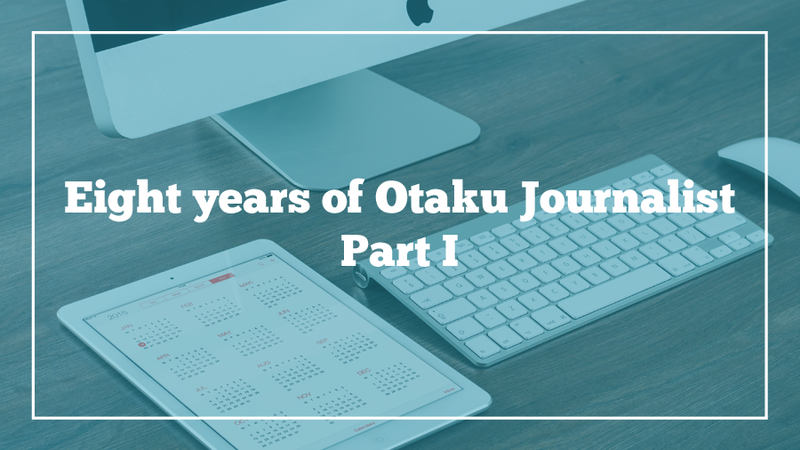 In the time since I wrote this, I signed a contract to do a writing + acting gig. I haven’t acted since high school, so I’ll keep you posted on how that turns out.